Here is a column by Brooke Dunn Parker, Brooklyn parent activist, about a recent controversial report by the Century Foundation, which identified 125 charter schools that are supposedly “diverse by design” – though on the whole, most analysts find that charters have had a segregating effect, according to the AP, NBC News, and the UCLA Civil Rights Project. Moreover, this list of 125 schools was selected from 5,692 charter schools – only a tiny number. The methodology is also questionable. The authors identify these schools by analyzing their enrollment, websites and survey responses from school leaders. Though the Century Foundation sent their survey about diversity to 971 charter schools, only 86 responded – which means that nearly 40 schools were put on the list even though the school leaders couldn’t be bothered to answer their survey. 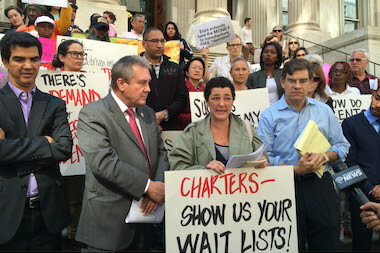 Several Success Academy charter schools were included on their list, including Success Academy Upper West, which has had multiple civil rights complaints lodged by parents against it. Finally, the report was financed by the Walton Foundation, the largest private funder of charter schools, who no doubt would like to whitewash their poor record of civil rights abuses. Please read the Network for Public Education and Schott Foundation report on how many charter schools violate students’ civil rights. Check out Brooke’s dive into the issue, informed by her experience with one of the supposedly “diverse by design” charter networks highlighted in the report, Citizens of the World Charter Schools. Brooke has previously written about these schools on our blog, here and here. I’m always disappointed and baffled when self-described “progressives” support charter schools. These same people and organizations often implicitly understand the serious problems related to privatizing prisons or the military yet offer their unquestioned support to privatizing schools. They rarely hear, let alone seek out, voices that might contradict that support. The Century Foundation is, sadly, a perfect example of this disconnect as shown by their recent report, “Diverse by Design Charter Schools ” that claims that charter schools, with their lack of regulation or “flexibility,” are ideally positioned to create integrated schools. The “Diverse by Design Charter Schools” report describes a growing movement of intentionally diverse charter schools that the researchers, Halley Potter and Kimberly Quick, believe are leading the charge to school integration in our nation’s segregated school districts. Much like the promise that charter schools will share their academic best practices with neighborhood public schools, they argue that “diverse by design” charter schools will show us all how to undo segregation. Leaving aside that public school students, parents, teachers, and taxpayers are still waiting for those charter schools whose “best practices” aren’t marketing, creaming, suspending, or cheating their way to high profits and test scores, the Century Foundation’s report on integrated charter schools is poorly researched and its policy recommendations are irresponsible. Notably, the only data that the Century Foundation gathered was the “racial and socioeconomic demographics of schools, school leader responses on a survey, and analysis of charter schools’ websites.” Can you imagine if one tried to assess the safety and efficacy of a pharmaceutical drug by a select sample of users, the website of the drug manufacturer, and the CEO’s responses to a survey? In contrast, a recent report by the New School, “How School Choice Divides New York City Elementary Schools” (see also this NY Times article about its findings) supports what many others have found: the overall pattern of choice (public and charter) in NYC increases segregation and concentrates the effects of poverty in zoned schools that would otherwise be less segregated had parents enrolled in them. The “Diverse by Design Charter Schools” report was followed up with separate studies on four individual “diverse by design” charter schools and/or networks. The study of Citizens of the World Charter Schools (CWC), was truly rankling. My community’s experience with CWC bears witness to the gross inaccuracies of the Century Foundation’s report and the hazards of believing in the claims of charter schools, rather than listening to on-the-ground voices and other research that may contradict the story they want to tell. The author of the report, Haley Potter, relates how CWC charter network staff, headquartered in Los Angeles, “began meeting with a group of parents in the Williamsburg neighborhood of Brooklyn,” but the truth is a lot more complex. In Williamsburg and Greenpoint, gentrification was gradually desegregating our schools, but instead, charter school carpetbaggers attempted to exploit some of the fears of white parents moving into an area with public schools composed of mostly Black and Hispanic students. Discussions about schools can raise questions about steering if there is a correlation between the quality of the schools and neighborhood racial composition--or if characterizations such as “a school with low test scores” or “a community with declining schools” become code words for racial or other differences in the community. Similarly, making unspoken distinctions by promoting a school in one district while keeping silent about the quality of another school can have the same effect. These become fair housing issues. Yet brokers could advise clients to refer to Grannis' website for the same purpose. When someone plugged in rental figures, certain neighborhoods and local schools would pop up with school grades, based on their test scores. Rather than controlling for the background of the student, as the DOE school grades attempted to do, the grades were solely determined by the raw test scores, which would tend to steer parents to schools with white or Asian students and wealthier socio-economic backgrounds. Grannis explained the system on Fox News. Grannis also formed an organization called Tapestry Project, to bring more charter schools into NYC. He began posting on a local neighborhood listserv for Williamsburg parents of young children, inviting them to be a part of an opportunity to create a “progressive” new public school. He brought in CWC network staff, who met with families in baby boutiques, yoga studios, and in new luxury condominiums along the waterfront. The announcements for these meetings were made on a private listserv. If you weren't part of a particular network of parents, you would never know about them. That’s how it started. Grannis himself lived in the Upper West Side of Manhattan and had never visited any of our schools to assess whether we needed a new one. We already had several neighborhood “Blue Ribbon” public schools, some of the best in New York City, that were slowly becoming more integrated, as white families were moving in. Still, most of our schools were under-enrolled because there had been a sharp decline of about 3,000 in the number of children under the age of five between 2000 and 2010. CWC claimed that there was a need for their “diverse” charter model in Williamsburg because the community was majority white, and our schools didn’t reflect that. This was implied in their proposal to the SUNY charter institute, one of the two charter authorizers in New York state. Their proposal included a graphic showing that the neighborhood was 55% white, though the schools were only 8% white, and then added: "We hope to offer families a public school option in CSD 14 that more closely mirrors their neighborhood composition." While it is true that our schools are less white than the overall population of Williamsburg, this was due to two factors: a large Hasidic Orthodox Jewish community that isn’t interested in enrolling their children in public schools, and many young single “hipsters” without any kids at all. If CWC had achieved its goal of 55% white students, this would have drawn so many white parents out of our public schools to make them even more segregated. We also were aware that there were not enough students of any background to open two new charters without hurting enrollment and thus funding at our neighborhood public schools. It just wasn’t smart planning. Considering that the Citizens of the World network at that point had only a single charter school in Los Angeles for one academic year, we questioned why they were trying to expand across the country so quickly. They didn’t have any record of success to build on. And though CWC boasted of “a progressive learning model, including project-based learning, a focus on social-emotional development, and a robust arts program”, when we looked at the proposed curriculum in their charter application, our public schools were using similar programs and curriculum. The plan for the CWC charter wasn’t any more progressive; they just had a larger marketing budget to try to convince parents that it was. Precious few public school families in Williamsburg at that time could have contributed anything near $1,300 a year per child to their public school. In the end, CWC was only approved by SUNY to open one school in Williamsburg, and another one in Crown Heights, Brooklyn. Both schools were designed to share an Executive Director and a Board of Directors. A diverse group of public school parents from across the district launched a lawsuit in January 2013, ultimately unsuccessful, to prevent SUNY from authorizing CWC. When the schools we send our children to and love are under-enrolled and underfunded, why should the state require the city to expend additional resources to open a charter school? We also pointed out that its proposed co-location with JHS 156 and Northside Charter School would deprive the other institutions of resources and space. In our lawsuit, we cited Education Law section 2852, which requires the charter authorizer to consider the demand for charter schools in the community when deciding whether to approve new schools, and yet SUNY had ignored how little demand there was in our district. In fact, SUNY had completely ignored the overwhelming opposition to this charter school among public school parents, community-based organizations and all our elected officials. We further questioned the sincerity of CWC’s interest in desegregation after we discovered their recruitment and enrollment plan. For all their talk of diversity, their internal leaked “marketing plan” identified their primary targets in Williamsburg as “Middle/Upper income/predominantly White” and in Crown Heights, “middle/upper income" parents. We started to investigate who these CWC charter people were, and, armed with Google, we quickly found seemingly serious problems with CWC and their board. Kriste Dragon, the CEO of the Citizens of the World charter network, and Board member Chris Forman were involved in the Wonder of Reading, an organization that had been contracted to renovate public libraries in the Los Angeles public schools. Yet Wonder of Reading hired subcontractors were found to have engaged in kickbacks, leading to huge cost overruns. It also appeared that when Wonder of Reading closed, they funneled all its money and resources into CWC. Both organizations used the same address and were run by the same executives and board members. Yet none of these problems were mentioned by Potter in the interviews with Dragon that make up the bulk of her reporting on her schools. There were many former employees and CWC families who were concerned about questionable practices by the Board and neglect of students within their Los Angeles schools. They sought us out, some risking violation of the non-disclosure agreements that CWC had made them sign. (Seriously. why would any school need NDAs?) We soon discovered that Dragon had planned to expand the school to targeted cities from the beginning and to become a franchise operation. CWC registered as a charitable corporation in California and promised that they would facilitate the creation and operation of nonprofit charter schools through planning, fundraising, academic support” and “to provide its services at no cost.“ Yet as soon as their non-profit status was granted, they quietly pushed through an exorbitant “licensing agreement” that would enable millions of dollars to flow directly into the hands of its California corporation. Almost immediately after registering as a nonprofit, in November 2012, a leaked document shows they had specific plans to expand to expand to four districts across the country between 2012 and 2017, with four schools in each district, including NYC (with two schools listed as “public” and two as “private”, whatever that means), Nashville, Los Angeles and Washington DC. Each planned school was listed as a “high ADA”, “marginal ADA” or “low ADA” – with the acronym presumably standing for Area Development Agreement, which is a term used for the fees paid by franchises of a commercial operation. NYC was the one district listed as providing a “high ADA” or management fee charged per school, starting at 8% in 2013, declining to 6.5%-7% in 2016 and to 1.5% in 2017. In contrast, the Citizens of the World CMO intended to charge their schools in Los Angeles a “Low ADA” ranging from 1.7% to 1.3%, depending on the year. They planned to charge their four DC charter schools a “Marginal ADA” ranging from 5% to 2.5%, and their Nashville schools a “Marginal ADA” with a management fee of 5% declining to 1.5%. In all, the corporation was projected to receive a total of about $5.6 million dollars by 2016, with more than half of these funds to be provided by NYC taxpayers. Why the fees would range so widely from own district to another is unclear; perhaps these were the fees they felt they could get away with from their authorizers. What is evident from this document that NYC was projected to be the “cash cow” for the entire franchise operation, with by far the largest percent fees per student, multiplied by the greatest per student amount that NYC allocates to charter school students. 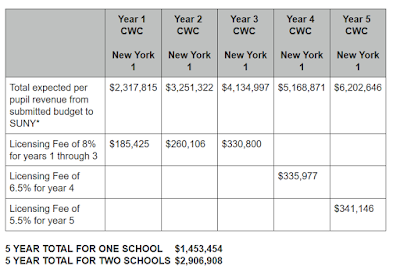 In October 2013, the Citizens of the World Charter Management Organization subsequently raised these projected fees in NYC for year five in their licensing agreement with the schools’ local boards. Instead of charging fees of only 1.5% of revenue in year five, the fees would remain at 5.5% per student, for a total of nearly three million dollars flowing from their NYC franchises over five years alone. 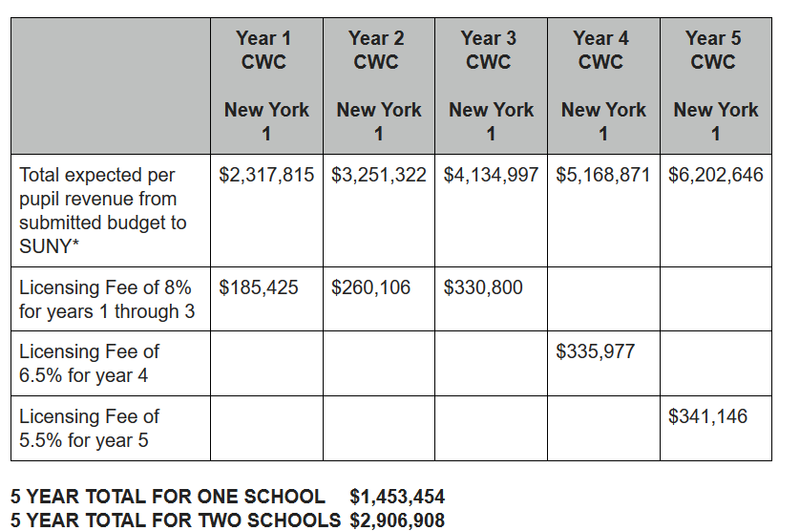 In short, the CWC push for establishing schools in New York City seems less about encouraging diversity, and more about amassing revenue that would accrue to their network. By July 2013, we had discovered enough incriminating information on CWC that Congresswoman Nydia Velazquez sent a request to the IRS to investigate their finances. When their charter schools did open in NYC, they had trouble attracting enough parents. Most students who attended their Williamsburg charter school lived outside the district, with the city, again, paying the bill for their busing. The schools’ under enrollment put CWC on probation with SUNY, with a deadline for improvement that was continually pushed back. Yet they continued recruiting without telling any of the parents that they were at risk of closure. In 2014-2015 school year, CWC Williamsburg suspended 5% of their students, more than twice as high as the district average, and CWC Crown Heights suspended 10% of their students, five times as high as the district average, according to figures compiled by the United University Professions from state data. Note that these two charters schools only had enrolled K-2nd grade students at that time. As Potter relates, CWC was able to open another charter school in Kansas City in the fall of 2016. In March 2017, they also applied to open a charter school in DC. A few months later, in June 2017, the DC Public Charter School Board rejected their application, explaining that the network’s “growth plan” was excessively “aggressive,” there was “inadequate support from the school management organization,” no “history of strong academic results with student populations … in NY and Kansas City,” and no “consistency in instructional approaches and implementation of the CWCS 'diversity by design' model." The Board also found that CWC had an inability to articulate the “non-academic benefits of this model. DC PCSB also had concerns about CWC DC’s governance structure. Based on the proposed governance structure, CWCS, CWCDC’s management organization and sole member, would have significant power over the local school that does not strike the right balance between local board authority and necessary control by the school management organization to ensure fidelity to the model. After submitting the application, CWCDC agreed to certain revisions to its governance structure that would afford more power to the CWCDC board. Had DC PCSB approved CWCDC’s application, such approval would have been conditioned on CWCDC agreeing to these and other revisions to its governance structure. Finally, in December 2017, five years after opening their doors in NYC, CWC was told by their authorizer, the SUNY Charter Institute, that they would not recommend the renewal of their NYC schools. CWC decided not to fight SUNY’s recommendation. Let’s be clear: CWC New York schools did not “decide to withdraw their charter renewal application,” as Potter puts it, out of generosity to the parents or the children they promised to serve. Their schools were forced to close. Despite all the promises that CWC would be a superior school, based on their “model” leadership, skills, and supposedly progressive curriculum, test scores at both New York City schools were abysmal. According to Potter, Kriste Dragon claimed the poor results were because their NYC local staff “did not fully implement the CWC model, in large part because they struggled to hire teachers and leaders with experience in project-based learning.” Yet what were those millions of dollars in licensing fees meant to accomplish, if the fault of the schools’ dismal performance lay with an inexperienced NYC school staff? What Potter doesn’t mention is that their Kansas City charter school was started with the help of a cool million dollars donated by the Walton Family Foundation, which also helped paid for the Century Foundation report. Neither does she report that one of the main reasons the Citizens of the World application for a charter school in DC was rejected was because of the inconsistent implementation of its “diverse by design” model, and the questionable relationship between the proposed DC charter school and the charter management organization, headquartered in Los Angeles. In the wake of their failed NYC experiment, hundreds of Citizens of the World students had their lives disrupted, and millions of city tax dollars were funneled out of our neighborhood public schools into their California organization. Unless someone stops them, more CWC charter schools will likely open throughout the country, with the story of their NYC experiments hidden from view, just as our community’s voice was ignored when we correctly warned that these schools would fail our children, while allowing the CMO to financially profit from them. Instead, this Century Foundation puff piece will be used to promote the network’s further expansion. In other words, CWC, along with other examples that Potter and Quick profile, are “good” charters. I have to doubt their judgement about the other “good” charters if they consider CWC one of them. I’m also concerned that if the Century Foundation is truly a “progressive, nonpartisan think tank that seeks to foster opportunity, reduce inequality, and promote security at home and abroad,” as they advertise themselves, why do they insist on promoting the privatization of education. There may be a small number of “good” privatized prisons, but one example doesn’t justify the existence of the rest. After all, as many of the parents of CWC New York charter schools have learned, a “good” charter school may be merely a matter of marketing and hype.